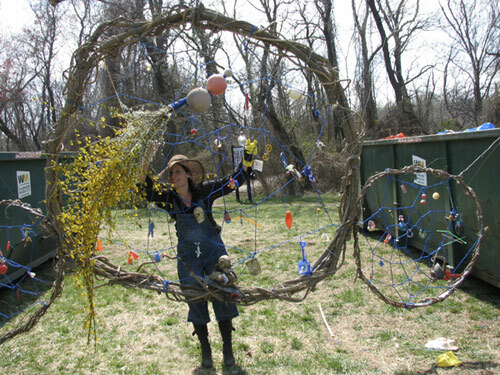 Mara G. Haseltine created the Water Molecule Dream Catcher (2007) for the 19th Annual Potomac River Watershed Cleanup that occurred on March 31st and April 1st, 2007. 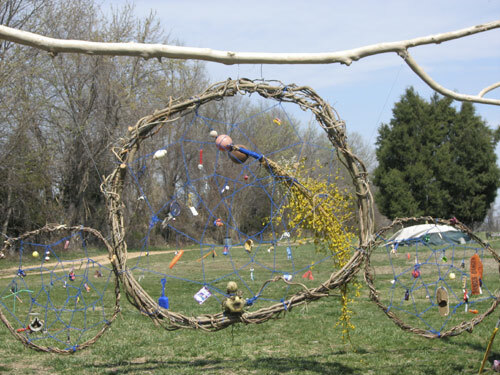 Inspired by nature and the natural sciences, the Water-Molecule Dream Catcher is a site-specific sculpture constructed at Alice Ferguson Foundation's Hard Bargain Farm. It celebrates the effort of all of the volunteers and the beauty of the water in a ritualized way in which the volunteers could participate in the creation of the sculpture. The sculpture is shaped like a cross section of a water molecule, with a large central oxygen atom flanked by smaller two hydrogen atoms. The Potomac River is not an isolated system, but connects to the living ocean. The shape of this sculpture is an homage to the marvelous chemical which connects all of life on the planet. Cleanup volunteers saved pieces of trash that were lightweight and colorful. Plastics and Styrofoam eventually break down into tiny particles that not only pollute the Potomac River, but our oceans as well, and eventually make their way into the living bodies of marine life. 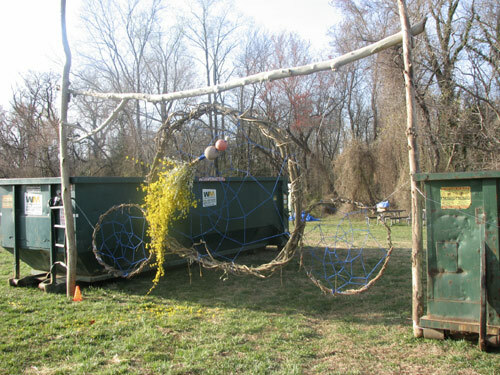 As volunteers brought their special items of trash they had collected directly from the Potomac Rover shoreline during AFF's annual Spring Cleanup, the artist attached those pieces to the webbed section of the dream catcher. The incredible range and variety of the trash that came out of the river in just three hours was astounding — just the tip of the iceberg. The crafting of the Water Molecule Dream Catcher was inspired by the incredible beauty of the Alice Ferguson Foundation's land and gardens. Using natural materials from the land, the structure's three hoops-are woven from Asiatic bittersweet collected at the edge of the woods. Asiatic bittersweet is an invasive vine from Asia that kills the trees, so pulling some of it down did the trees a favor! The “dream catcher” was supported by water-polished trees found along the shoreline. 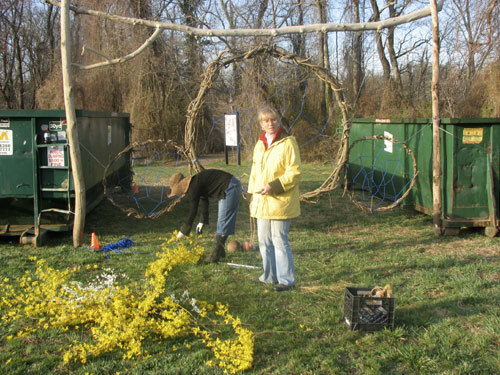 On the morning of the annual Cleanup, the “feather” was made from early spring-blossoming forsythia and bridal-wreath spirea gathered in the AFF's garden that overlooks a beautiful valley near the Potomac River. The title Water Molecule Dream Catcher originates from the Native American tradition of “dream catchers” put above infants? beds to catch nightmares in the webbed section, while the sweet dreams flow through the center. The dream we have is for clean, pure water. 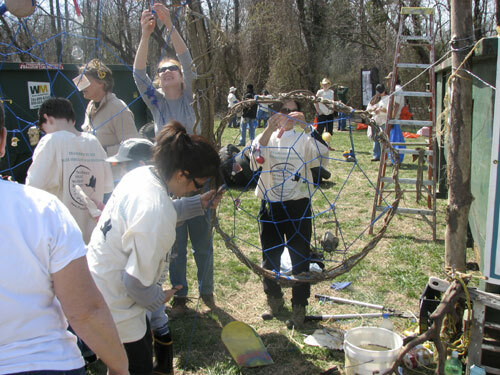 It was especially wonderful to create a “dream catcher” on the Alice Ferguson Foundation's land because of its rich history as natural historic landmark of several Native American peoples. Materials: invasive vine, flowers, string and trash.